Have you ever been catfished? Have you ever been tricked into believing that someone you love is actually a different person in reality? The highly popular MTV series, Catfish, has given the already battered reputation of this helpless animal another vicious blow. To be 'catfished' is to be duped by a person who is pretending to be another person in real life. The phenomenon is an offshoot of the anonymity of social media sites like Facebook and represents an example of the dangers that arise as the increased integration of sophisticated technology changes how we interact with each other. But even outside the cultural context of a western society, the catfish is a symbol of misfortune. The giant catfish known as the Namazu brings destruction and chaos to the islands of Japan by causing deadly earthquakes. Legend has it that Namazu lives in the mud beneath Japan and carries the islands on his back. Devastating earthquakes result whenever Namazu moves around. To keep him under control, the demigod Kashima holds a rock above Namazu's head. In Japan, the catfish has become so closely linked with earthquakes, that the country's Tsunami early warning system bears the image of the fish. Even in a religious context, the catfish has been given a bad name. Due to its lack of scales, many religious groups in Christianity, Islam, and Judaism consider them to be 'unclean animals' and partaking in delicacies like grilled catfish or Catfish Curry are believed to be sins against God. Poor catfish! He's always getting the short end of the stick. Catfish Tattoos are rather unusual to have because they represent destruction or some form of negativity. But this not so little fish is a beloved symbol of American South and as time progresses, attitudes towards these unfortunate aquatic animals will slowly change for the better. Most Catfish Tattoos tend to feature tribal patterns, since this design adds an air of intrigue and spirituality to the artwork. A Catfish lurks in the murky depths of rivers and bayous, devouring prey and avoiding humans. Tribal Catfish Tattoo designs tend to have influences from native tribes living in the Americas (North and South). 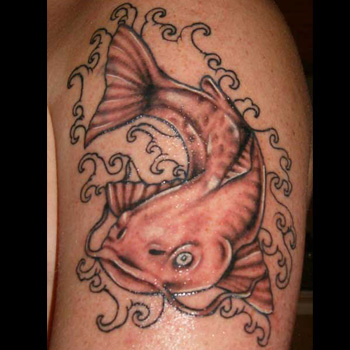 Catfish Tattoos are the symbol of the survivalist. This tattoo says that just as the catfish lives and thrives in the murkiest waters, so too do you thrive even when surrounded by the most difficult situation. A Tribal Catfish Tattoo expresses to the world that there's much more to you than what meets the eye. Should you to get inked, why not get a Catfish Tattoo? You can add any number of elements in your tattoo design; the only limit is your boundless imagination. When cooking up your new Catfish inspired artwork, it's wise to think about what the new design represents to you and where you plan to place it on your body. It can be difficult, but if you need inspiration, our design team can help you to create a really great piece. For help, visit our design page at www.itattoodesigns.com and request your favorite artist on our Custom Design Page.